Our Lord has been gracious to us by allowing us convenient times to sit back and consider what He has done. The glory of His Name has been shown over and over in the work He’s allowed us (you and us and the Ethiopians) to do in the past 2 years. Desperate people have been helped. Christ has become the living Saviour to many. Lost ones far away have heard the good news that Jesus has come and is living still. Remote congregations have been encouraged as they have erected their meeting places. The physical and spiritual strength of evangelists has been revived. Church leaders have been encouraged in the work of our Lord. All of these good things have been the work of our Lord Jesus. If you have seen any good in us, any strength in us, any courage in us, any wisdom in us, it is not of us, but it is of our Lord Jesus. He is a Master at what He does; He is a Master at building His Kingdom. We have watched Him countless times arrange the circumstances of this work, so that just the right person with just the right skill or resource came to us at just the right time. And how did they know to come? Somehow they heard of the work and of the need. So in this final report of our Dec’06-Jan’07 trip, we would like to place before you a summary of the work as we understand His will to be. Someone once asked me, “Becky Lynn, what are your long-term goals? What do you plan to have accomplished in 10 or 15 years?” Well, my answer is very simple: “I want to look ahead and behind, and be able to say with the song-writer, ‘Jesus led me all the way.’” Our long-term goal is to be obedient. You see, our Lord doesn’t show us all the little things ahead of us. But He gives light for the next step. And He gives memory of the past steps. And when we put those two things together, we have all we need to trust Him with what Life holds in 5-10-15 years. What our Lord has accomplished through us in the past year…. Personal assistance …medical, nutritional, and practical help has been given to persecuted orphans, war widows, and orphans. Educational assistance… a scholarship was given for one student to Bible college; the “Through the Bible” cassette series has been duplicated for rural churches; the flannelgraph set on the Life of Jesus has been completed; in-person classes have been taught. 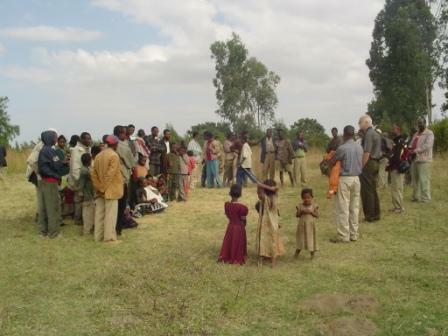 Evangelist aid…evangelists have been given love gifts, medical help, protein bars, clothes, satchels, and a bicycle. Balance in hand after above: approximately $1100. These men are braving new frontiers for the Gospel. They are usually separated from their families because of the danger to their families, or because of lack of funding (so their families live with relatives). Most of these men are sent by the mother church to the rural areas; a very few remain in the town of the mother church. They travel from village to village by walking or by riding bicycles. While in the rural areas they may not know where they will sleep or when they will eat. Often they are chased or ambushed by Muslims or Orthodox fanatics. Most of them have been beaten, often to the point of being left for dead. Because they are usually malnourished, they often get sick with malaria, typhoid, and/or typhus. Because their life is difficult, they have a hard time getting a wife, and their children suffer in school. It is important that aid be given with wisdom, so as not to disrupt the responsibility of the mother church or generate strife between evangelists. T here are 4 areas of aid we feel led to give. All of these will be done through the mother church, and accounting will be given to us by them; aid will not go directly to the evangelists. Salary assistance. ..$50/mo for a single evangelist, $75/mo for a family. Medical assistance…a pool of funds to supply medical needs, hygiene/disease education. Training…$500/yr for Bible school or Bible college, on-site Bible teaching. Nutritional aid…protein bars/powder, multivitamins, water purifiers. 2. Urgent: Purchase land for the Zobechame church in Alaba. This rural church is the only church for which we have needed to buy land. Eight of the nine church buildings we have erected have been put on land that was donated free of charge by a person in the congregation! Where can you find such generosity in American churches? Truly, this is the Lord’s doing! The land for the Zobechame church is in the final stages of negotiation. It is a good, large land. (See Report 3b.) Today we talked by phone with a church leader. They are hoping that the price will be less than 50,000 birr (which is only $5,600 in our money). The government is passing a new regulation, so it is important that the purchase price be paid as soon as possible after agreement. As you can see from the above, only $1,100 remains in the account. Is our Lord calling you to help with this purchase? Time is short. Develop Bible training for rural leaders and congregations. The current system of training is by traveling rural evangelists, and by removing the leaders to towns or cities far away for several years of training. There are huge problems with this strategy. If we can bring the training to them, it is much better. And if we can bring it in a format that relieves the evangelists, it is much better. At first we were planning to use cassette tapes and solar-powered tape recorders. However, now we have found a much better way by using IPod technology. A ministry has developed what they call a Mobile School. Please pray for us as we explore this possibility. 4. A 4-Wheel drive vehicle for the Alaba church. The road into Alaba Town is mostly paved. 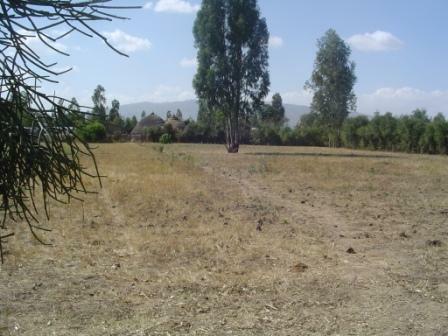 However, outside of town, in the rural areas, the terrain is very rugged. Only 4-wheel drive vehicles can cope. It is not uncommon to have urgent situations arise that necessitate emergency transport of persons in the rural areas. Sometimes an evangelist has fallen ill. Sometimes a Christian has been attacked and needs medical care. Sometimes, as in summer of 05, a person is killed and there is no one willing to help bury a dead Christian. In addition to these situations, there is the matter of hauling equipment, like speakers and projectors to show the Jesus Film. This equipment is delicate; currently it is being hauled on the backs of people or donkeys. In the past, when situations arose requiring a vehicle, the church has rented a vehicle, if they could find one, and if the owner was willing. The rent is usually higher than normal because the vehicle is usually owned by a Muslim. 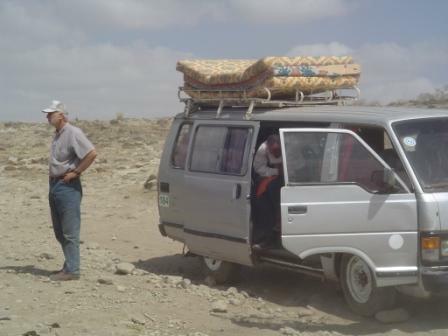 We would like to gather funds to purchase a Toyota 4WD long bed with a luggage rack. The chairs can be removed to make it into an ambulance, or to haul equipment. By squeezing in, about 10-12 people can be hauled for Bible conferences, etc. Obviously, Dave and I will also use it, so we will be able to have more contact with the rural areas. We have advertised to everyone possible in Ethiopia that we want to buy this vehicle. When our Lord provides it, we expect the price to be about $20-30,000. Yes, the price is high, but the need is also great. And in His time and way, He will provide. Perhaps His plan is for you to be a part of that provision. 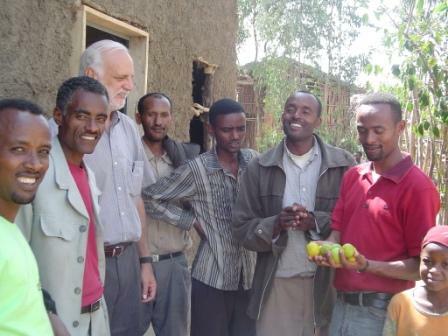 May our Lord bless you for your kindness and love for these brethren in Ethiopia!